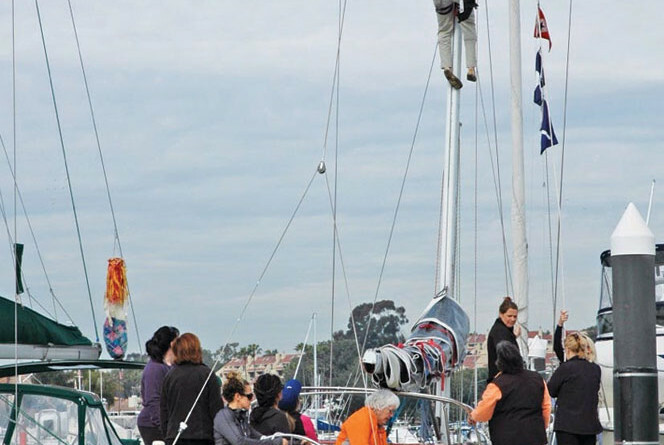 CORONA DEL MAR — Women sailors can learn the ins and outs of boating during the daylong, ladies-only 27th annual Women’s Sailing Convention, Feb. 6 at Bahia Corinthian Yacht Club. The workshops offer beginners and experts a welcoming environment to learn more about all topics sailing, according to Boat Owners Association of The United States (BoatUS), which has been the event’s primary sponsor since its inception. Attendees select a combination of workshops in areas that best fits their interest and ability, and top women sailors from all over Southern California, many of whom are USCG Licensed Captains, will present 30 topics. Workshops include: Welcome Aboard (for beginners), Diesels, Introduction to Racing, Tactics, Docking, Suddenly Singlehanded Interactive, Weather, Sail Trim, Basic Navigation, Maintenance Mania, DIY Canvas Projects, How to Heave a Line, Nighttime Sailing & Navigation, Hassel-Free Heads, Spinnaker Rigging, Offshore Cruising, and Introduction to Sailing. New workshops planned this year include The Race Committee Experience, and Power Boating. The Race Starts workshop will be held in Harbor 20s. This year’s speaker will be Margaret Bonds Podlich who serves as president of BoatUS. Podlich is a life-long boater who has competed in a wide range of national and international events including finishing fourth in this year’s Rolex Women’s International Keelboat Regatta. The convention fee of $215 includes workshops, breakfast, lunch, dinner, souvenirs and handouts. Prepaid-registrations are required as space is limited to approximately 250. To obtain a reservation form email Gail@scya.org or call 951-677-8121. After Dec. 10 bookings can be made online at womenssailingconvention.com. The discounted Early Bird registration fee of $200 is available until Dec. 31.